The letters D.R.E.A.M. stand for Dogs for Reading, Education, Assistance and More. After you’ve taken a pet therapy class or private lesson you must pass the Reading With Rover (RWR) D.R.E.A.M. practical evaluation. If you’re ready to test please email info@readingwithrover.org to schedule your test. You passed? GREAT! After we have your completed paperwork we will submit a Washington State Patrol background check for you and you will be issued a temporary badge in the form of a letter that is good for 6 months from the day you passed your test. You must have this letter with you when you visit or your hours will not count. Now you and your dog are ready to get going! Start a log sheet of your visits because you and your dog team must have 12 hours of logged volunteer time. Log sheets are available here. The log sheet will be necessary to turn in once you complete all the following steps. Shadow an approved Reading with Rover mentor without your dog at two (2) different therapy events. One of these events must be a children’s reading event, the other can be any other therapy visit (i.e. Libraries, bookstores etc.) (Community events and fairs do not qualify). Visits must be recorded in a written log and signed off by your mentor. There must be a designated mentor at the session so prior notification to info@readingwithrover.org is necessary to ensure a mentor is available. These two visits can be done prior to passing your test but must be done before volunteering WITH your dog. Shadow an approved Reading with Rover mentor with your dog at ten (10) different therapy events. At least four (4) of these visits must be at children’s reading events. One of the reading events must be held at the Reading with Rover room at Redmond Town Center. Visits must be recorded in a written log and signed off by your mentor. These reads are scheduled regularly and dates can be found on the Reading with Rover events page. Your shadowing and Reading Room visits are considered part of your 12 volunteer hours needed to become a Reading With Rover D.R.E.A.M. Dog Team. Complete these requirements within 6 months of passing your test and you will be issued your 2-year photo ID badge. Your badge is good for 2 years from your testing date. You will need to renew your badge by retesting. Please email info@readingwithrover.org to schedule a retest. You are now an official D.R.E.A.M. Team member for Reading with Rover! Don’t wait! The clock starts ticking as soon as you pass your test. We are happy to help you find places to visit and practice with your dog so that you are able to meet the requirements within 180 days. If you are unable to meet the requirements, your permanent badge cannot be issued and your temporary badge will expire. You may test again at a later date when you have the time to meet the required protocol. *We welcome Pet Partner teams! 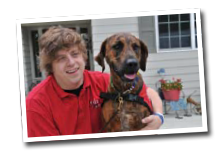 Please email us for the details regarding Pet Partners policy and how you can join our team! **Please note that if you plan to volunteer in a school setting, you will be asked to do an additional dog-less shadow visit to that particular school before you bring your dog. This will give you a chance to meet the staff that you will be working with and, since programs vary from school to school, you’ll get an idea of how your school’s program is set up.